"These 110-million-year-old footprints and trackways were made by carnivorous dinosaurs commonly known as raptors," Dr. Romilio said. "These new tracks are just one centimetre in length, which means the dinosaur that made them was an animal you could have easily held in your hand. "They are the world's smallest dinosaur tracks." "The diminutive sizes of these new tracks are extraordinary; the tracks were made by tiny dinosaurs about the size of sparrows," Dr. Romilio said. "Raptors placed only two of their toes on the ground, while the third toe was retracted like a cat's claw." 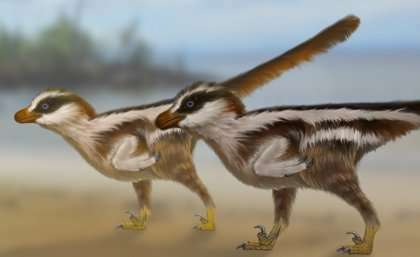 "Very small dinosaur species like the Chinese Microraptor were crow-sized, but these had feet too large to match the South Korean footprints," Dr. Romilio said. "In addition to tiny dinosaur tracks, we have footprints made by birds, pterosaurs, lizards, turtles, mammals, and even frogs," he said. "We have named these small tracks Dromaeosauriformipes rarus, which means rare footprints made by a member of the raptor family known as dromaeosaurs," Professor Kim said.